Understanding the origin and evolution of the Cape Verde endemic flora is essential for the conservation in this Biodiversity Hotspot. 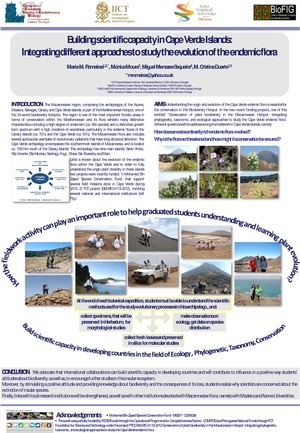 A recent funding research project by FCT-Portugal, entitled “Conservation of plant biodiversity in the Macaronesian Hotspot: Integrating phylogenetic, taxonomic, and ecological approaches to study the Cape Verde endemic flora” will address different questions, namely: (a) How does an extraordinarily rich endemic flora evolved? and (b) Why is the flora so threatened and how might its conservation be secured? 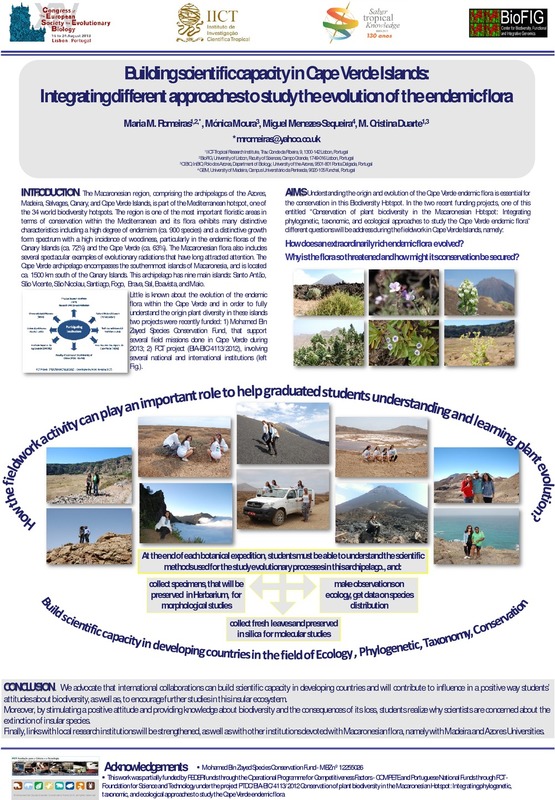 In this communication we show how the fieldwork activity can play an important role to help graduated students understanding and learning plant evolution; it is expected that at the end of each botanical expedition, students will be able to understand the scientific methods used for the study evolutionary processes in this archipelago. We advocate that international collaborations can build scientific capacity in developing countries and will contribute to influence in a positive way students’ attitudes about biodiversity, as well as, to encourage further studies in this insular ecosystem. Moreover, by stimulating a positive attitude and providing knowledge about biodiversity and the consequences of its loss, students realize why scientists are concerned about the extinction of insular species. Finally, links with local research institutions will be strengthened, as well as with other institutions devoted with Macaronesian flora, namely with Madeira and Azores Universities. Understanding the origins and diversification of oceanic island flora has long fascinated evolutionary biologists, ever since Darwin. The Macaronesian Islands, in the North-East Atlantic Region, are considered a hot-spot of biodiversity and contain a large proportion of endemic taxa. Recent molecular studies are providing insights into the patterns of colonization and radiation within the endemic plant species, while the relationships between the wild (i.e. endemics and natives) and the crop species have not been suitably addressed from an evolutionary perspective. 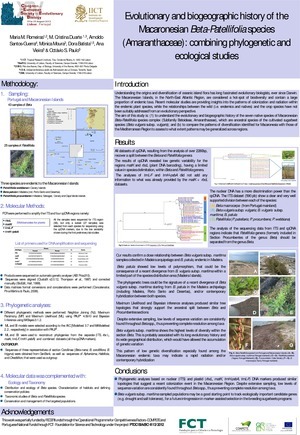 The aim of this study is to understand the evolutionary and biogeographic history of the seven native species of Macaronesian Beta-Patellifolia species complex (Subfamily Betoideae, Amaranthaceae), which are ancestral species of the cultivated sugarbeet species (Beta vulgaris subsp. vulgaris). We compare the patterns of diversification identified for Macaronesia with those of the Mediterranean Region to assess to what extent patterns may be generalized across regions. Phylogenetic analyses based on nuclear (ITS) and plastid (rbcL, matK, trnH-psbA, trnL-F) DNA markers produced similar topologies that suggest a recent colonization event in the Macaronesian Region. Despite extensive sampling, low levels of sequence variation are consistently found throughout Beta spp., thus preventing complete resolution among taxa. 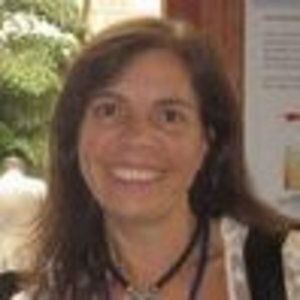 Origins and diversification of these endemics, natives and crop species within the Macaronesian Region will be discussed in a biogeographic context. It is widely recognized that the conservation of the Crop Wild Relatives (CWR) in their wild habitats, where they can continue to adapt and evolve along with their natural surroundings, is fundamental to ensure the continuous supply of the novel genetic material critical for future crop improvement. The genus Beta L. (Amaranthaceae) is an important source of crops, primarily for sugar production. Within a broader research project aiming to select appropriate wild accessions and identify priority localities in which to establish genetic reserves of the wild Beta species occurring in Portugal, the aim of this study was to assess the cytogenetic diversity of wild Beta populations. For this, a large scale sampling of natural populations of B. vulgaris subsp. 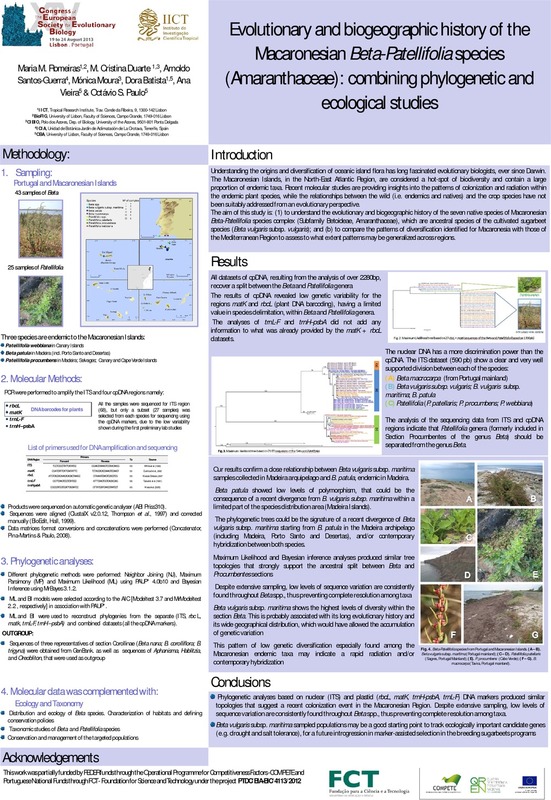 maritima and B. macrocarpa was performed across Portugal (including also the archipelagos of the Azores and Madeira) and genome size and ploidy level estimated using flow cytometry. The analysed populations were mostly diploid, except for one population of B. vulgaris subsp. maritima that presented both diploid and tetraploid individuals, and for two populations of B. macrocarpa where two or three cytotypes (diploids, tetraploids and/or hexaploids) were found. Leaves of both species presented variable levels of endopolyploidy. The obtained results will be discussed within the context of interspecific hybridization and cryptic diversity, and constitute significant data for the conservation of these wild Beta crop relatives.